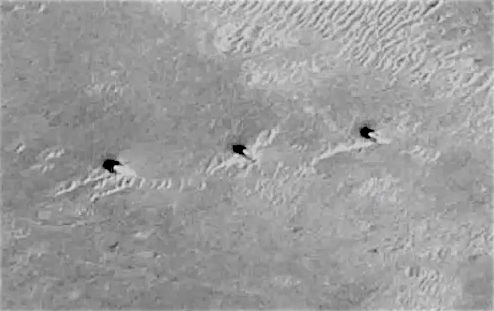 UFO SIGHTINGS DAILY: Three Mile High Towers Found On Mars Side By Side, Dec 2016, Video, UFO Sighting News. Three Mile High Towers Found On Mars Side By Side, Dec 2016, Video, UFO Sighting News. There are a whole planet full of buildings and artifacts to be discovered on Mars. Here is a fantastic example of that posted by Youtube user Mundodesconocido. He found three towers that look to be almost a mile in hight or more. They all look like they were made well because none of them are destroyed. They would be perfect for setting up a human Mars base at...if they are empty of course. Investigating on some Mars images, we have recently found a row of huge towers located in the Martian area of Terra Meridiani. Due to their peculiar features, we believe that they have an artificial origin. In the following video, we will show you all the amazing information, evidences as well as animated 3D models that will allow you to evaluate correctly the information we propose.